Attention of the world is being drawn to the carbon zero and wastes zero projects out of the Resource Management Projects. 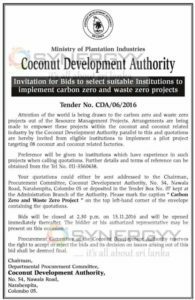 Arrangements are being made to empower these projects within the coconut and coconut related industry by the Coconut Development Authority parallel to this and quotations are hereby invited from eligible institutions to implement a pilot project targeting 08 coconut and coconut related factories. Preference will be given to institutions which have experience in such projects when calling quotations. 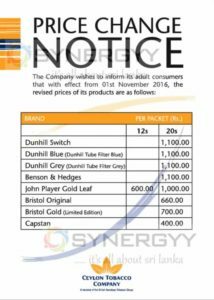 Further details and terms of reference can be obtained from the Tel No. 011-3560438. Your quotations could either be sent addressed to the Chairman, Procurement Committee, Coconut Development Authority, No. 54, Nawala Road, Narahenpita, Colombo 05 or deposited in the Tender Box No. 07 kept at the Administration Branch of the Authority. Please mark the caption ” Carbon Zero and Waste Zero Project” on the top left-hand corner of the envelope containing the quotations. Bids will be closed at 2.30 p.m. on 15.11.2016 and will be opened immediately thereafter. The bidder or his authorized representative may be present on this occasion. Procurement Committee of the Coconut Development Authority reserves the right to accept or reject the bids and its decision on issues arising out of this bid shall be deemed final. Users of Commercial Bank’s Mobile Banking facility now have a choice of menus in transliterated Sinhala and Tamil, following an enhancement of the platform by Sri Lanka’s largest private bank. Available on the USSD (Unstructured Supplementary Service Data) version of the Bank’s Mobile Banking service, these menus contain Sinhala and Tamil words written in English text for users who are more familiar with vernacular terminology. Available to mobile phone users on the Dialog, Mobitel and Etisalat networks. Commercial Bank’s easy to access menu-driven USSD-based mobile banking service offers greater convenience and functionality, enabling users to carryout numerous banking transactions including Account Balance and Credit Card Balance Inquiries, Utility Bill Payments, Credit Card settlements, Fund Transfers between own accounts. Exchange Rate Inquiries, PIN Changes, Mobile Reloads and requests for Mini Statements. Because these services are offered on the USSD platform, they can be accessed from any mobile hand set. An Internet connection or special software is not required to access the service. Customers who wish to use the Mobile Banking service simply fill in an application form at a Commercial Bank branch and receive a password together with instructions on activation and operation of the facility. Prime Minister stated that the Trincomalee harbour will be developed to international level with a container terminal at the second International Colombo Maritime Conference at the Galadari Hotel. he said that the proposed North Eastern port of Trincomalee will be developed under a plan from Singapore’s Surbana Jurong. He also said will support India’s ‘Sagarmala’ program of building ports around the country and will use para diplomacy to build stronger links with key Southern Indian state. “Joining the Sagarmala is an advantage for us, not a disadvantage”. Southern Indian states and Sri Lanka could form a 500 billion dollar economy, he said. Shipping Minister said that having a partner from the Indian subcontinent would be a plus point. Sri Lanka also wanted a shipping line to be an investor, who would take over the East Terminal to bring in new volumes and prevent cannibalizing of existing traffic. Colombo North Port terminals will be built within the next 10 years, providing another 10 million TEUs in capacity. Mega Maldives airlines will launch direct flights from male to Colombo. They will operate a Boeing 767, 300 seater flight on Thursday, Saturday and Monday. Founded in 2009, Mega Maldives Airlines, a US-Maldives joint venture has now become the fourth largest international airline to the Maldives flying to Shanghai, Beijing and three other destinations, Jeddah, Narita and Kuala Lumpur. Almost 10% of all of tourists now arrive to the Maldives on Mega. We see an increased demand from the Chinese market who wants to touch both Sri Lanka and Male in their schedules and this is one reason for us to extend to Colombo, an official from the General Sales Agent for Mega Maldives, Mack Air of John Keells Group said. The airline hopes to include New Delhi to their radar this year. Mega Maldives Airlines currently operates a fleet of five (5) aircraft: four (4) wide bodied Boeing 767-300 HR aircraft and one Boeing 757-200ERW. 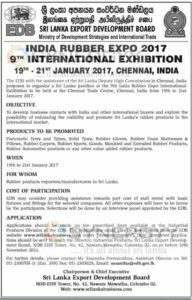 Sri Lanka Export Development Board Invites applications for the India Rubber Expo 2017 schedule to be on 19th to 21st January 2017 in Chennai, India. The EDB with the assistance of the Sri Lanka Deputy High Commission in Chennai, India proposes to organize a Sri Lanka pavilion at the 9th India Rubber Expo International Exhibition to be held at the Chennai Trade Centre, Chennai, India from 19th to 21st January 2017. To develop business contacts with India and other international buyers and explore the possibility of enhancing the visibility and promote Sri Lanka’s rubber products in the international market. Pneumatic Tyres and Tubes, Solid Tyres, Rubber Gloves, Rubber Foam Mattresses & Pillows, Rubber Carpets, Rubber Sports, Goods, Moulded and Extruded Rubber Products, Rubber Automotive products or any other value added rubber products. Participants: Rubber products exporters/manufacturers in Sri Lanka. EDB may consider providing assistance towards part cost of stall rental with basic fixtures and fittings for the selected companies. All other expenses will have to be borne by the participants. Selections will be done by an interview panel appointed by the EDB. 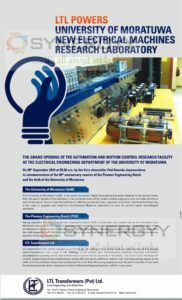 Applications should be made on the prescribed form available at the Industrial Products Division of the EDB. The applications could also be downloaded from the EDB website www.srilankabusniess.com under “Announcements”. Duly completed applications should be sent to reach the Director, Industrial Products, Sri Lanka Export Development Board, NDB-EDB Tower, No. 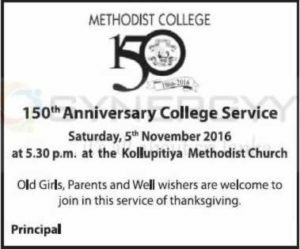 42, Nawatn Mawatha, Colombo 02, on or before 10th November 2016. 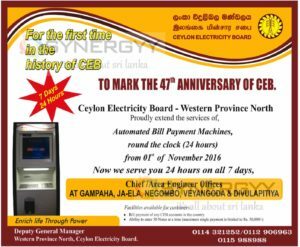 Ceylon Electricity Board – Western Province North has introduced 5 automated bill payment machines in Gampaha, Ja-Ela, Negombo, Veyangoda & Divulapitiya. Bill payment of any CEB accounts in the country. The Australian archaeologist Dr Damian Evans, whose findings will be published in the Journal of Archaeological Science, will announce that cutting-edge airborne laser scanning technology has revealed multiple cities between 900 and 1,400 years old beneath the tropical forest floor, some of which rival the size of Cambodia’s capital, Phnom Penh. Law and Order Minister has directed the Ministry Secretary to take immediate steps to install CCTV cameras to cover Police cells in all Police stations and ensure a round the clock observation of Police cells. Minister also directed the Ministry Secretary to submit a report containing plans to ensure round the clock observation of Police cells through CCTV cameras in all Police stations. The Army opened the ‘Orr’s Hill Army Museum’ at the 22 Division Headquarters Trincomalee. At the invitation of the 22 Division Headquarters of the Security Force Headquarters – East, Army Commander Lieutenant General Crishanthe De Silva, declared open the new Museum. The open air Museum, the first-ever largest of the kind in the country, boasts of architectural marvel, situated atop the popular. ‘Orr’s Hill’, overlooking the Trincomalee harbour. Specific exhibition areas segmented as Infantry weapons, Armored vehicles, Artillery guns and a resource person- manned audio-visual room, offer visitors a wholesome picture of the exhibits, some of which have relevance even to the colonial times. Similarly, the exhibits on display are mostly weapons that were used against the terrorists during the peak of the humanitarian operation. All funds, generated through the Museum are to be used for welfare of families of fallen War Heroes, disabled veterans and serving Army personnel of the 22 Division. A percentage of the proceeds has been allocated for maintenance and improvement of the Museum. Sri Lanka Insurance announces one of the Corporate social responsibility to donate a Continuous Renal Replacement Therapy Machine is a significant need at the Pediatric Oncology Unit at the National Cancer Institute, Maharagama. Sri Lanka Insurance states that Give us a missed call to our “Call to Donate” hotline 1357. 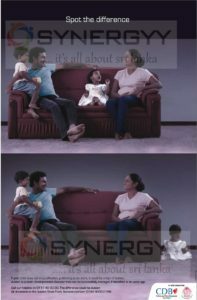 For every missed call made, Sri Lanka Insurance will donate Rs. 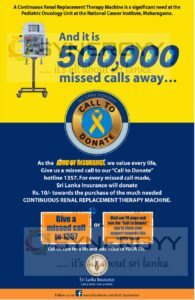 10/- towards the purchase of the much needed Continuous Renal Replacement Therapy Machine. Call us, care for a life and add value to Your life. Senkadagala Finance PLC announces that they source Rs. 3 Billion from public by issuing Senior, Unsecured, listed, redeemable, rate debenture for Rs. 2 Billion and if it over subscribed will extended to Rs. 3 Billion. 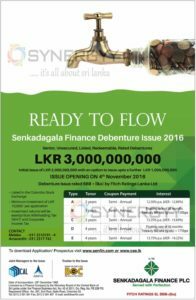 Issue opening on 4th November 2016 with below 5 optional debentures with BBB+ Fitch rating Lanka ltd. The Bandaranaike International Airport (BIA) runway will be renovated at a cost of US $18 million. Airport and Aviation Services (Sri Lanka) Ltd. Chairman Saman Ediriweera said. Under the project, it has been planned to overlay the runway. The BIA has only one runway and over 950,000 aircraft operations have been carried out since its’ commissioning over three decades. The runway has been designed and constructed in the mid-eighties to meet the then requirements. The overlaying project will limit to three months from January 5 next year to April 5 and the overlaying work will be carried out from 8.00 a.m. to 4.30 p.m. daily. During this period no flights will be carried out and airlines are informed to carry out their flight operations from 4.30 p.m. to 8.00 a.m.. Ediriweera said. “After commissioning air traffic, no major rehabilitation work has been carried out to the runway. Therefore, the International Civil Aviation Organisation (ICAO) has recommended an overlaying of the runway to improve runway surface condition for safe operations of aircraft.” he said. In line with the overlaying of the existing runway, several airport sector development activities such as overlaying of parallel taxiways, connecting taxiways, design of new rapid exit taxiways (RETs) and by pass taxiways, installation of new airfield ground lighting (AGL) system and modification of existing apron will be carried out. All these moves are being taken to handle a further nine million passenger per annum aiming to cater to the ever increasing passenger volume in the region. With the BIA development project being carried out in three stages, the passenger handling capacity of the BIA will be enhanced by further nine million passengers per annum and on completion, the total passenger handling capacity of the airport will be increased to 15 million passengers per annum. The Indian government’s assistance has been sought to develop the Palaly Airport, said Development Strategies and International Trade Minister. The minister said Cabinet would take a decision on the airport in the next 2-3 months. India has been engaged in various development projects. Over USS2 billion investments from India is envisaged within the next three to four years, said Indian Minister for State Commerce and Industry of India. She said that these investments would be in oil farms in Trincomalee, renewable energy, infrastructure and in other new areas of business. Indian and Sri Lankan relations are now at its best and there are more investors who want to invest in Sri Lanka. They are looking for more opportunities here, she emphasized. She further stated that the Indian Petroleum Corporation together with Lanka Indian Oil Corporation would invest in the Trincomalee oil tank farm. Sri Lanka is on the brink of sealing a deal with Chinese and Dubai based airlines and infrastructure companies to run the operations of the loss making Mattala International Airport in Hambantota. He said that the Request for Proposals for SriLankan Airlines too has been completed and a decision of the new player would be announced soon. He also said that a US based investment company too was very serious on SriLankan Airlines bid. The Finance Minister has agreed not to impose any taxes any further on the Tourism Industry, disclosed Tourism Minister. And the government will also explore the possibility to provide duty free concessions in the direction of refurbishment of old hotels. The minister also stated to media that he instructed to Sri Lanka Institute of Tourism & Hotel Management to double up the intake of students and train them to cater to the increase of rooms by 45,000. And increase the emoluments of his staff in order to absorb quality staff even from abroad. Hoteliers must help to fill in the void by coming up with their own training programmes to get out of this difficulty, the Minister insisted. “In house training is what matters not at the classroom. That is where you can come in and contribute to the development of trained staff in the hotel industry,” the Minister cautioned. He further state that there were new trends in tourism with the development of religious tourism, agriculture tourism and medical tourism in which Sri Lanka can make inroads. The Minister said a foreign company had expressed their willingness to fund a huge convention center in Sri Lanka which could host 5,000 delegates. He said the Japanese were going to take over the entire development of Trincomalee and in Hambantota, the Chinese are asking for 15,000 acres to set up their enterprises. By 2020 the Tourist Industry could be able to bring the highest amount of foreign exchange to Sri Lanka. Foshwa Lanka (PVT) LTD a Malaysian Visa Centre has relocated to the below address from world trade center. The Indian banking system has left a $10-billion position unhedged amid foreign exchange deposit redemptions, making the rupee vulnerable to a sudden depreciation in the next few months. On the other hand, such a drop would act as a booster for exports and possibly narrow the trade deficit although imports of oil and other commodities would become costlier, said experts, some of whom suggested the gap may have deliberately been left uncovered. Three years after the Reserve Bank of India sought to shore up the rupee through foreign currency nonresident-bank (FCNR-B) deposits, the country is bracing for an outflow as these get redeemed. The rupee was at 66.72 a dollar on Friday. Experts baffled by RBI move, The Indian currency was at 66.68 a dollar a week back and may weaken to 67.50-68.00 a dollar by December, dealers said. According to a note prepared by one of India’s top private sector banks, there’s a $9.5-billion gap between $22.4 billion of FCNR-B maturities and $12.9 billion of forward contracts for October and November. Export push, A fall in the rupee should make Indian goods more competitive in the global market. Indian exports revived in September to grow 4.62 per cent on year to $22.8 billion with 18 of 30 exporting sectors showing growth. This was the second instance of growth this year after June when exports rose 1.27 per cent after declining 18 months in a row. With a 2.5 per cent fall in imports to $31.2 billion, the trade deficit stood at $8.33 billion in September. The hedging shortfall will generate dollar demand in excess of what flows in regularly via overseas investments and non-resident deposits, said a senior bank executive. The rupee, therefore, is likely to come under pressure, having remained in a tight band since January despite the Chinese devaluation. Citing RBI data for August end, the bank report cited above said forward long contracts for September were worth $2.9 billion against $2.1 billion in FCNR-B repayments, but those in October-November are at $12.9 billion against $22.4 billion of maturing deposits. For December and beyond, forward longs stood at $13.3 billion versus $2.3 billion in repayments. Tesla Motors said it would collaborate with Japan’s Panasonic Corp to manufacture solar cells and modules in New York. Under the agreement, which is a nonbinding letter of intent, Tesla said it will use the cells and modules in a solar energy system that will work seamlessly with its energy storage products Powerwall and Power-pack. The Japanese company is already working with the U.S. automaker to supply batteries for the Model 3, its first mass-market car. Panasonic is expected to begin production at the Buffalo facility in 2017 and Tesla intends to provide a long-term purchase commitment for those cells, Tesla said in a statement, adding the agreement is contingent on shareholders’ approval of its acquisition of SolarCity. Last week Tesla and SolarCity Corp shareholders agreed to vote on the proposed merger on Nov. 17, and the automaker said it would provide plans for the combined company ahead of the vote. If you child preferring to be alone, please read this. If you spot the difference in above photographs and if your child does not enjoy affection, preferring to be alone, it could be a sign of Autism. Autism is a brain developmental disorder that can be successfully managed if identified at an early age. 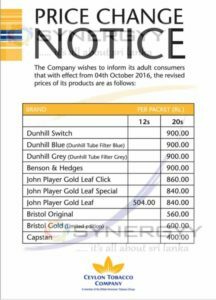 Posted on October 30, 2016 October 30, 2016 Categories NEWS, Sri Lanka NewsTags breaking news, breaking news today, business articles, business new, business news, business news today, current news, daily news, financial news, gossip, gossip e news, gossip news, hotnews, international business news, latest business news, latest important news, latest news, latest news on today, latest news today, local news, new news, news, news articles, news gossip, news headlines today, news paper, news stories, news today, news update, recent news, recent world news, the news, today business news, today hot news, today news, today's headline news, today's news headlines, top news today, uk business news, world business news, world latest news, world news, world news today, world news today liveLeave a comment on If you child preferring to be alone, please read this. Axiata Group Berhad Malaysia is looking at aggressively investment in addition to mobile and data communication and want to get involved in setting up of a payment gateway, 5G, smart metering, IOT (Internet of Things) and other similar services, tracking of transport via GPS and other means too is an area we are looking at pursuing. To date Axiata Group Berhad Malaysia is the biggest Foreign Direct investor to Sri Lanka. “Its 9.4% of the total FDl’s received by Sri Lanka and we are very proud about it. We have a permanent staff of 3,200 as well.” He recalled that Dialog started their business as the fourth telecom operator in 1995 and in four years moved to the top slot which we are maintaining till now. Axiata Group Berhad Malaysia Chief Corporate Officer, Idham Nawawi said, Axiata is keeping our options open with regard to acquiring of another mobile operator in Sri Lanka, he further said he strongly believes a country like Sri Lanka should have only three players instead of five. And Axiata looking forward a good offer to take over a company. Further he stated that the Axiata Group is closing on a deal to acquire Indian based Bharti Airtel In Bangladesh and thought of entering to Nepal and Philippines if there is a good proposition. But it doesn’t have an idea of entering to china and compete with China mobile which is largest in the world. A total of 3514 candidates, who sat for the Korean Language Proficiency Examination were selected for jobs in South Korea, the Sri Lanka Bureau of Foreign Employment announced yesterday. The official results of the examination could be obtained from the Foreign Employment Bureau website www.slbfe.lk. This was the first exam held under the newly launched point system. According to the results of the Korean language proficiency examination held on August 8-September 19 and October 1-2, 3514 candidates out of 20, 187 candidates who sat for the examination, had qualified to go to Korea for employment. The exams were held for those who sought jobs in the fisheries and production sectors and the Korean Human Resources Institute had published the list of names of the candidates who obtained marks above the cut-off mark in the respective disciplines. Interviews for the qualified candidates would be held from October 17 to 20 at 14 regional centres including Anuradhapura, Kandy, Ratnapura, Kadawatha, Galle, Tangalle, Badulla and Trincomalee. The KLP exam was held under the supervision of the Examinations Department.